Join us at 9:00 p.m. each Thursday in the Witherspoon Maple Room when school is in session. The Westminster FCA chapter of this national organization was organized in 1969 with the purpose of confronting athletes and coaches with the challenge and adventure of serving Christ. FCA meetings feature talks given by professional athletes, student athletes, coaches and fans. Everyone is invited to attend. If you have any questions please contact any member of the Leadership Team: Romanie Schweickert, Megan Simpson, Marie Barnard, Vanessa Restifo and Advisors: Brad Tokar & Tom Rapchak. Meetings are held at 9:00 p.m. each Tuesday in the Watto Room, McKelvey Campus Center during the semester. Open to ALL students, the Newman Club is a club of Catholic culture and Catholic fellowship. If you have any questions please contact any member of the Leadership Team: Joshua Bartosh, Courtney Labritz, Jackson Gastmeyer, Megan Ratay, Fr. Michael Peck (advisor), and Jesse Mann (advisor). Join us at 7:30 p.m. on Wednesday in the Chapel. Celebration Choir is new this year to Westminster and is open to all students who want to be a part of this exciting opportunity for ministry through worship music. We need all voices, mens' and womens' and instrumentalists as well. You can be a part of charting new waters as we explore different styles of worship in this choir. We can explore contemporary Christian, gospel, jazz, and traditional hymn arrangements together. The possibilities are endless because the musical genres are endless as are the many ways we express our worship through music. So if you love to sing, play an instrument, guitar, piano, keyboard, percussion, winds ....come and join us. For more information contact the director, Dan Forsberg. The Chapel has a Handbell Choir and is under the direction of Gina Vance. The Handbell Choir participates in Sunday night Open Door Worship (Vespers) several times during the year. The Choir rehearses once a week in the Chapel. 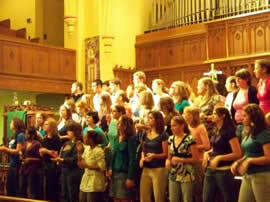 Rehearsals are at 7:00 p.m. on Tuesdays in the Chapel. If you have a background in handbells or would like to learn come and join us. For more information, contact Joe Bandi. Choose from a number of different topics and meeting times. Groups form each semester for study and fellowship -- please contact the Chapel Office for an updated listing or contact Rev. Jim Mohr if you are interested in forming a Small Group or Bible Study. Vintage Bible Study meets on Tuesdays at 8:15 PM in McKelvey Campus Center Room 255. Open to all students on campus the program is a live video stream from a speaker and then discussion. Interested in knowing more contact Christina Kopnitsky. Small Groups are always being developed and are listed below when groups are being offered. Please return at a later date to view additional Small Group studies being offered. If you are interested, but need information about starting a Small Group contact Rev. Jim Mohr (College Chaplain) or If you would like to offer a Small Group opportunity please contact the Chapel Office to share the information about your Small Group so that the Chapel Office may include it in this posting and in other Chapel Office resources. We are continually adding speakers and events to your Campus Ministry program. Please return periodically to view our schedule of speakers and/or events. David LaMotte, World Changing 101: Challenging the Myth of Powerlessness. Sunday, September 23, 2018 at 7:00 PM (Wallace Memorial Chapel) – Mr. LaMotte is a musician, speaker, author and advocate for peacemakers and world changers. Anthony Griggs. Sunday, October 21, 2018 at 7:00 PM (Wallace Memorial Chapel) –Mr. Griggs is a former NFL football player and is a motivational speaker and life coach. He is owner and president of AG Squared Networks, Inc., a business and personal development company which assists businesses, individuals, teams and organizations reach their optimal growth and development. Campus and Community are invited to all of these events. Monday, October 15, 2018 at 7:00 PM in Berlin Lounge – Dr. Jessica Garver, Professor Chemistry and her husband & Mr. Joshua Sayers. Monday, November 12, 2018 at 7:00 PM in Berlin Lounge – Dr. Erin Smith, Assoc. Dean of LIS and Dr. Peter Smith, Professor of Chemistry. Previous Guest Speakers: David Newell aka "Mr. McFeely" from Mister Roger's Neighborhood, Tunch Ilkin (former Pittsburgh Steeler, 1980-1992 and current radio analyst for the Pittsburgh Steelers), Roberto Clemente Jr. (motivational speaker: "Sportsmanship: On a Team, On Your Own"), Rev. Augustin Kabongo (International Peacemaker from the Democratic Republic of the Congo), Rev. Yousif Matar Kodi (International Peacemaker from Sudan) and Karla Ramos-Amaya (International Peacemaker from El Salvador), Moses Mkandawire (International Peacemaker from Malawi), Rev. Dr. Patricia K. Tull, Rev. Ray Jones, Ron Righter, Dr. R. Bruce Bickel and Bakithi Kumalo. Concerts: David Bailey, Shaded Gray, Induction of Reason, Valley Below, J.D. Eicher and Bakithi Kumalo and the South African All Stars.